The New Orleans City Planning Commission has recommended dropping the core element of a plan aimed at increasing the amount of affordable housing in the city, balking at a plan that would allow the city to require that apartments for low-income renters be included in developments in specific parts of the city. However, the commission last week did endorse two other changes that would require developers seeking zoning changes to provide affordable units and allow the city to offer incentives in exchange for including such units in other projects. The Planning Commission’s recommendations are not binding on the City Council, which is expected to have the final say on the affordable housing mandates, known as inclusionary zoning, in March. Several commissioners said they did not feel comfortable moving forward with the more aggressive elements of the proposal before the expected completion in February of an economic feasibility study that would look at which neighborhoods should be covered by the new requirements. But housing advocates said the requirements are needed to begin making a dent in the city’s affordable housing crisis. And, with state lawmakers expected to make another run next year at passing a law to prevent cities from adopting such policies, they argued that time was of the essence. “It is disappointing the commission is choosing to privilege the desires of business owners and developers over the very clear and expressed desires of residents of our community,” said Cashauna Hill, executive director of the Greater New Orleans Fair Housing Action Center. Dozens of housing advocates and residents argued in favor of the mandatory affordable housing policy at the commission’s meeting Tuesday, pointing to what they said is the increasing difficulty of finding affordable housing in the city, particularly in areas near plentiful jobs, shops and other desirable amenities. Developers who opposed the plan said implementing it would drive up construction costs, making all housing more expensive. The planning staff had recommended three separate policies designed to work together as part of a “smart mix” proposal for increasing the number of affordable units in the city. The one most sought by advocates would create a new type of zoning district where any project with more than 10 residential units would be required to set aside at least 12 percent of those homes for lower-income residents. Exactly where those districts would be located would be hashed out later by the Planning Commission and the City Council, likely with input from the study to be released in February. But only two of the seven commissioners at the meeting, Kyle Wedberg and Jonathan Stewart, backed that proposal. he commission did recommend the other two proposed policies. One would say that affordable units must be included whenever a developer seeks to rezone a property to a more intense residential classification. The other would create a new category of development that would offer looser regulations for projects that include affordable units. The commission recommended those proposals on a 6-1 vote, with Commissioner Kelly Brown dissenting. The City Council has considered the idea of affordable housing mandates for years, but the plans have never made it this far in the process. Looming over the debate is the likelihood that opponents will urge the Legislature next year to ban such inclusionary zoning policies in Louisiana. Lawmakers passed a bill to do just that last year, but Gov. John Bel Edwards vetoed it. 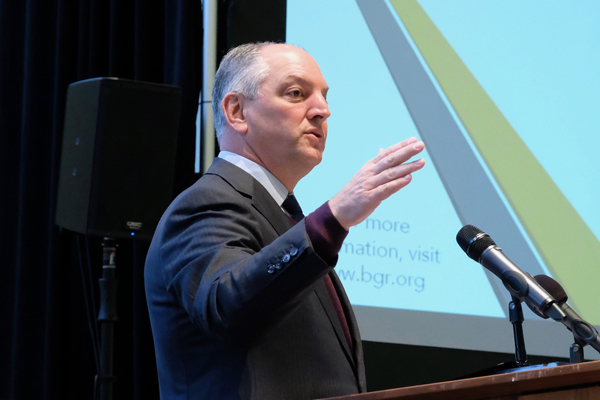 But noting that no local governments had yet implemented such policies, Edwards suggested at the time that he wouldn’t continue to veto similar bills unless cities show they actually want to implement those policies. Edwards reiterated that sentiment last week when asked about his veto during a briefing hosted by the Bureau of Governmental Research. “I did serve notice on municipalities across Louisiana that if this is something you’re interested in, you need to do it. And if you’re not going to do it, we’ll turn the page on it and we’ll try to figure out some other way to make sure we have affordable housing,” Edwards said.